Hardback. The story of John Gotti, the man who headed the largest and most powerful criminal organisation in the world, the Gambino branch of the American Mafia. With 250 "made" (formally inducted) members, 550 "associate" members, and several thousand auxiliaries, the Gambino Family - which retained the name of its deceased progenitor, Carlo Gambino - ran operations that earned around $5 billion a year. 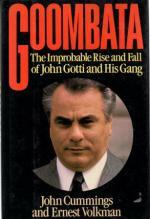 How Gotti, a low-level hood, and a small group of his 'goombata' (Sicilian slang for "old friends" or "buddies") managed to take control of the entire Gambino empire is a wildly improbable tale, by turns horrifying and comic. Although Gotti was among the most publicised gangsters in US history, much about him remained unknown. Going behind the sensational press reports about John Gotti, the authors probe the real world of the Mafia: its unique lifestyle, its intricate rituals, the rigid but unwritten code of behaviour, the rules of apprenticeship, the world of Mafia wives and mistresses, how "organised" crime is organised, and the curious symbiosis between the 'goombata' and the police detectives and FBI agents out to destroy them. Also examined are the dramatic courtroom battles that swirled around Gotti, particularly the shocking story behind the bungling of a crucial case against him. Illus. + Dramatis Personae and Index. 289pp. lge. 8vo. h/back. With black remainder mk. to lower edge o/w Vg+ in Nr. F. dw. A fairly heavy book which will require additional postage if shipped overseas.